The strength of a brand lies in the fact that people immediately recognise it, and rely on it without a doubt. The TÜV brand is such a brand – worldwide. It is a protected brand that identifies all TÜV testing companies. It can only be used by Technical Inspection Associations (TÜV) or TÜV subsidiaries. It is enforceable worldwide under trade mark law because the brand is registered with the German Patent and Trade Mark Office (DPMA), the Office for Harmonisation in the Internal Market (OHIM) and many other foreign trade mark offices. TÜV Saarland e.V. emerged from the Pfälzischer Dampfkessel- Revisions-Verein, founded in 1871. As a self-regulating organ of the economy, the purpose of the TÜV is to protect people, the environment and property from the adverse effects of technical equipment or facilities of all kinds. The purpose of the Foundation is to promote scientific research and education in the field of technical sciences, in particular safety, and related fields. According to the certificate issued by Sulzbach tax office, directory number 231, the TÜV Saarland Foundation serves exclusively non-profit purposes within the meaning of §§ 51 ff of the fiscal code. 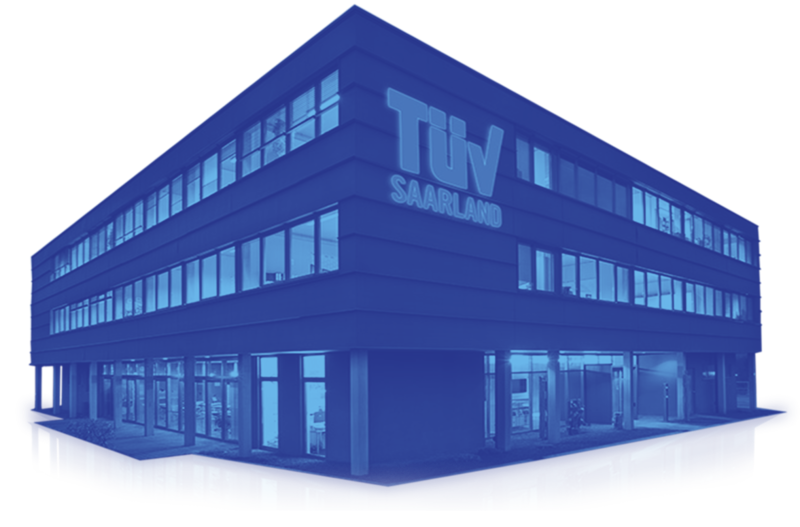 TÜV Saarland Holding GmbH is primarily an administration and real estate service for our affiliated companies. We offer commercial and administrative services to both subsidiaries and affiliates, as well as to external companies on the basis of management service agreements. SECTOR Cert is an independent company accredited by the German Accreditation Body (DAkkS) and the Central Office of the Federal States for Security Technology (ZLS). This applies to the legally regulated area according to DIN EN ISO/IEC 17024, as well as to the area not regulated by law. The SECTOR Cert certification programme reliably provides the same high level worldwide. VECTOR TUB GmbH is a technical consulting company focusing on personnel qualification for non-destructive testing. VECTOR is also the largest training and testing centre of the accredited DAkkS personnel certification body SECTOR Cert. Examinations are offered in all personnel qualification levels of non-destructive material testing in accordance with ISO 9712 – the only SECTOR Cert authorised centre to do so worldwide. TÜV Seminare organises and runs specialist conferences and seminars. More than 500 topics are available on different dates and in different locations. Two things are always in focus: small learning groups; and the highest quality. Whether at the Sulzbach, Hattingen and Nuremberg locations or in-house training in the companies. Whether it’s presentation technology, the catering or the air-conditioned rooms. TÜV Seminare always offers a top level. SG-Qualitätssicherung GmbH is a testing institute in the field of non-destructive material testing, founded in 1985 and accredited since 1992. SGQ offers a wide range of non-destructive testing methods. Testing is carried out both at our own premises, including in two state-of-the-art radiation protection rooms, or locally, in mobile testing. Around fifty materials inspectors, qualified and certified to ISO9712, PED and SCC**, are in action for the company today. International competence and regional presence: this is the best way to describe SGS-TÜV Saar GmbH. The SGS-TÜV is a joint venture of the SGS Group Germany and TÜV Saarland e.V. The SGS Group is the world leader in testing, inspection, verification and certification. TÜV Saarland e.V. has its headquarters in Sulzbach/Saar. In 2008, the competences were brought together under the umbrella of the joint subsidiary SGS-TÜV Saar, pooling their expert knowledge. SGS-TÜV Saar is represented at five locations. ZWP AR is a DIN EN ISO/IEC 17025: 2005 accredited testing laboratory that specialises in high tech products in the field of various ultrasonic techniques. Around 30 experienced employees from testing and administration meet the requirements of DIN EN 473 and ASNT. In addition, we are a modern service provider that saves our customers a lot of administration through our current app applications. TÜV Saarland Certification GmbH offers management system certification in the automotive sector. The audits, based on the standards ISO TS / IATF 16949, VDA 6.x and KBA, are carried out by accredited, experienced and competent auditors. The core services of TÜV Saarland Automobil GmbH include main and exhaust emission tests as well as acceptance tests. These services are provided both at the technical test centres and by the employees of the mobile service in the workshops. Together with our partner TÜV Rheinland, all technical inspection bodies and the mobile service of TÜV Saarland Automobil GmbH can meet the high technical demands of vehicle inspection on a sustainable basis. As an IT and data protection specialist company of the TÜV Saarland Group, tüv.tekit advises and performs checks in accordance with legal requirements as well as standard market quality standards such as ISO/IEC 27001, BSI basic protection or the guidelines of authorities and associations. Other activities include the assumption of the external data protection officer, the BDSG (Federal Data Protection Act), the DSGVO (Data Protection Basic Regulation) as well as a variety of compliance issues. ProTerra provides consultancy on the themes of operational environmental protection, plant safety and occupational health and safety. We help to carry out cost and time-optimised approval and environmental projects. Numerous accreditations and approvals attest to our expertise: Technical supervisory organisation (TÜO) EfbV (Specialised Waste Management Companies Ordinance); environmental verifier organisation according to EMAS (DAU – German Society for the Accreditation and Registration of Environmental Verifiers); certification body according to BioSt-NachV (Biomass Electricity Sustainability Ordinance) or BioKraft-NachV (Biofuel Sustainability Ordinance) (BLE – German Federal Agency for Agriculture and Food); accredited organisation for the examination of greenhouse gas emissions reports and tonne Kilometre reports according to DIN EN ISO 14065:2013 and Regulation (EU) No 600/2012 (excerpt). As a competent, full-service partner, TÜV Saarland Immobilienbewertung GmbH has specialised in real estate services since 2001. By continually expanding our range of services in order to react flexibly to the requirements of the market, TÜV Saarland Immobilienbewertung offers private and commercial customers comprehensive services in the real estate sector – fast, reliable, inexpensive. TÜV Saarland e.V. emerged from the Pfälzischer Dampfkessel- Revisions-Verein, founded in 1871. Its statute defines its task as the “protection of people, the environment and material assets from the adverse impacts of technical installations or equipment of any kind”. Today, TÜV Saarland e.V. is the lead organisation of the TÜV Saarland Group. TÜV Saarland Holding GmbH is a management company in the traditional sense. Not only the affiliated companies benefit from the management and real estate service. The classical commercial and management services are also supplied by the subsidiaries and affiliated companies, as well as external companies. The statute of this non-profit foundation earmarks the funds for the promotion of scientific research and teaching of technical sciences and related subject areas. These may include scientific studies / research projects or academic degrees in technical subjects.